Rammbo XL GPU Mining Rig. +188 MH/s - AMD RX mining series - 65% more Efficient than the rest. Rammbo Miners, a product line of Komplete Tech, a computer company based right here in the USA. Lethally Efficient mining rigs, use up to 60% less power than our competitors. Team Rammbo professionals have been building custom computers for over 20 years. With all that knowledge, they have configured the most efficient GPU miners on the market. Plug + Play, comes pre-configured so you are one call away from mining. All Rammbo Miner mining rigs come with FREE REMOTE SETUP and 1 MONTH OF TEAM RAMMBO RIG MONITORING. Team Rammbo is here to have your back while you're out there in the fight. Using custom configured AMD RX Mining Edition GPUs, Team Rammbo has accomplished mining at efficiency rates that were thought to be unobtainable. With our custom bios, the Rammbo Miner 1 runs 65% more efficient than its competitor while not losing any mining speed at all. Even though your monthly operation budget is low, your monthly payout wont be. Built with our custom Rammbo Racks and Rammbo Bios. No one else can even come close. Our Racks provide a static free and well ventilated environment, while our custom bios on the GPUs and motherboard, push the limits of mining. Best Power usage and speeds on the market. All of our parts are brand new and are right out of the box. Intel 7th Gen Celeron CPU. Motherboard with support for 12 GPUs (Asus). 4 GB DDR4 3200 RAM/Memory. 6 x AMD RX 470 4GB Mining Edition GPUs - Our graphics cards come with modded bioses for energy efficiency and increased hash rate. We modify the GPUs to be not just be efficient, we modify so they're Lethally Efficient! 1 120GB Solid State Drive. Rammbo Miner's Rammbo frame. Built and designed by Team Rammbo. Built to last and protect against static electricty. Has 4-6 dedicated fans with controller for perfect temperature control. (fits up to 8 GPUs). 1 9 inch HD screen. 2 Corsair 1000w Power Supplys. 6 X USB 3.0 PCI-E 1X to 16X Extender Riser Adapter. Pre-installed ethOS OS (based on Linux; much more stable and faster than Windows). Fully configured and pre-installed Mining software. Control your mining rig remotely from anywhere. Monero: 4200 H/s (Duel Mining recommendation). These number are subect to market price increases and decreases. These figures vary based on the total network hash rate and on the ETH to USD conversion rate. Block reward is fixed at 3 ETH and future block reward reductions are not taken into account. The average block time used in the calculation is 15 seconds. Network hash rate varies over time, this is just an estimation based on current values. 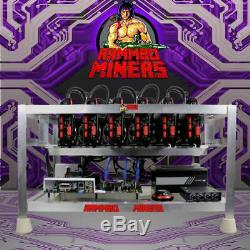 The Rammbo XL is the most "Lethally Efficient" mining rig there is and we don't say that lightly. With 6 - AMD RX 470 mining edition GPUs and our custome bioses at full power, your rig won't just out perform other minging rigs it will do it using less than half the power. Your Rammbo Miner mining rig will require one standard 15/20A circuits. This RM1 will Pull 550-600 watts per hour and will use about half of the amperage the 15/20A circuit can handle. So be mindfull of what is pluged in to that circuit. Always use a surge protector! With over 20 years experience in building custom computers, we have no problem guaranteeing our products. We Stand by our products and want to help our customers in whatever way we can. If any part of your rig fails or doesnt operate to specifications, then we fix it. It is voided by, but not limited to, any of the following conditions: any parts are modified, removed, re-configured, electrically or physically damaged. The Operating software(s) that are installed come in a pre-configured state and if modified by anyone other than a Team Rammbo professional, will void all warranties. If it is not a hardware and the software or operating system have you in the trenches then let Team Rammbo give you some cover. After receiving your mining rig the battle has just begun. But Don't Worry Team Rammbo is right there with you! With Team Rammbo's advance knowledge and good ole fashion customer service, your rig will be up and running within just a few hours of unboxing. Once you have received your Rammbo Miner rig out of the packaging, all you have to do is plug it into the wall and plug it into your router. From there, just give us a call and let Team Rammbo professionals take it from the there. Dont have a wallet addresses yet? No problem, Team Rammbo can help you set one up. 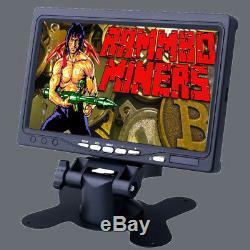 After Team Rammbo professionals set the configurations of your Rammbo Miner rig, it's off to battle. But don't worry, you're not going into battle alone. Our Team Rammbo professionals will remotely monitor your Rammbo Miner rig for a full thirty days after mining has officially started. This will ensure that your rig is ready for battle and is running as LETHALLY EFFICIENT as Johnny Rammbo himself. Youv'e mined some coins, Now what? What happens if crypto market fails? Your rig is made up of some top end computer components and they all have great re-sale value. Rammbo Miners also stands behind their customers. All the coins (Zcash, Ethereum and others) can be easily exchanged to Bitcoin and USD using any online exchanges. Rammbo RM1 +90MH/s (3 x AMD RX series GPUs). 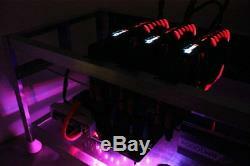 Rammbo 1 +90MH/s w/ 60% less power (3 x AMD Mining Edition GPUs) - THIS ITEM. Rammbo XL +190MH/s w/ 60% less power (6 x AMD Mining Edition GPUs). Rammbo XL8 +340 MH/s (8 x GTX 1070 ti). On Rammbo Miner's Website. Message us today to find out more. Rig: One box 30x20x20 L. Package Weight:+/- 45 lbs. Over 20 years building and servicing custom computers and over 5 years providing the best tech consulting and support for small business and consumers. Rammbo Miners may be a new name, but the Team has been in it from the start. You only talk to a pro. Team Rammbo professionals have your back. Johhny Rammbo is our leader. He has seen battle and knows its trials. He brings the team one clear and ruthless agenda... That is how he served all those wars, and now that's what he brings to this team. You know there's more coins out there. We are fully stocked and ready to meet any quantity. Our Team Rammbo professionals can build any cryptomining rig you'd like. Need a hands on a installation project? We offer our knowledgeable Teamm Rammbo Pros at great rates! The volatility of the cryptocurrency market and other factors, effect profits and speeds. The profit numbers above may change. Mining hastrates vary due to server difficulty and pools used and may make numbers vary +/-12%. Parts may be a different brand than listed above, but all parts are tested by Rammbo Miners and are deemed to be equal or better than what's specified above. You will also be notified of any changes made to parts or software configurations. The item "Rammbo XL GPU mining Rig +188 MH/s Ethereum Monero Zcash" is in sale since Friday, February 9, 2018. This item is in the category "Coins & Paper Money\Virtual Currency\Miners". The seller is "kompletetech" and is located in New Milford, Connecticut.